“That’s what’s really scary,” added Sowell, who was one of the hacking targets. Most of the targets’ work was classified. Yet as many as 40 percent of them clicked on the hackers’ phishing links, the AP analysis indicates. That was the first step in potentially opening their personal email accounts or computer files to data theft by the digital spies. “I clicked on it and instantly knew that I had been had,” the retired Air Force major general said. Poss said he realized his mistake before entering his credentials, which would have exposed his email to the hackers. Drone consultant Keven Gambold, a hacking target himself, said the espionage could help Russia catch up with the Americans. “This would allow them to leapfrog years of hard-won experience,” he said. The AP has previously reported on Fancy Bear’s attempts to break into the Gmail accounts of Hillary Clinton’s presidential campaign, American national security officials, journalists, and Kremlin critics and adversaries around the world. U.S. intelligence agencies have concluded the hackers worked for the Kremlin and stole U.S. campaign email to tilt the 2016 election toward Donald Trump — all of which Russian leader Vladimir Putin has denied. So far, though, Russia has nothing that compares with the new-generation U.S. Reaper, which has been called “the most feared” U.S. drone. 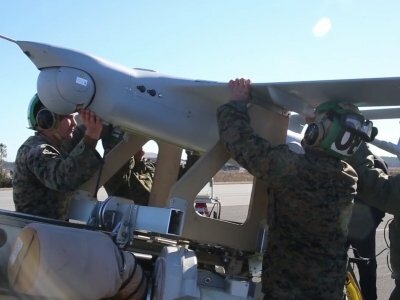 General Atomics’ 5,000-pound mega-drone can fly more than 1,000 miles (1,600 kilometers) to deliver Hellfire missiles and smart bombs. It has seen action in Afghanistan, Iraq and Syria. In a reference to an X-37B flight in May 2015, Russian Deputy Prime Minister Dmitry Rogozin invoked the vehicle as evidence that his country’s space program was faltering. “The United States is pushing ahead,” he warned Russian lawmakers. In 2013, the CIA signed a $600 million deal with web giant Amazon to build a system to share secure data across the U.S. intelligence community. Other spy services followed, and the government cleared them last year to move classified data to the cloud at the “secret” level — a step below the nation’s most sensitive information. Fancy Bear’s target list suggests the Russians have noticed these developments. “They said we have a Fancy Bear issue we need to talk about,” said security consultant Bill Davidson. He said an Air Force cybersecurity investigator inspected his computer shortly after the 2015 phishing attempt but found no sign that it succeeded. He believes he was contacted because his name was recognized at the Air Force Office of Special Investigations, where he used to work. The FBI declined to give on-the-record details of its response to this Russian operation. Agency spokeswoman Jillian Stickels said the FBI does sometimes notify individual targets. “The FBI takes ... all potential threats to public and private sector systems very seriously,” she said in an email. However, three people familiar with the matter — including a current and a former government official — previously told the AP that the FBI knew the details of Fancy Bear’s phishing campaign for more than a year. Pressed about notification in that case, a senior FBI official, who was not authorized to publicly discuss the hacking operation because of its sensitivity, said the bureau was overwhelmed by the sheer number of attempted hacks. “It’s a matter of triaging to the best of our ability the volume of the targets who are out there,” he said. A Pentagon spokeswoman, Heather Babb, said she could release no details about any Defense Department response, citing “operational security reasons.” But she said the department recognizes the evolving cyber threat and continues to update training and technology. “This extends to all of our workforce — military, civilian and contractor,” she added. The Defense Security Service, which protects classified U.S. technology and trains industry in computer security, focuses on safeguarding corporate computer networks. “We simply have no insight into or oversight of anyone’s personal email accounts or how they are protected or notified when something is amiss,” spokeswoman Cynthia McGovern said in an email. Jerome Pearson, a space system and drone developer, acknowledged that he has not focused on security training at his company, Star Technology, where Buet has consulted. “No, we really haven’t done that,” he said with a nervous laugh. “We may be a little bit remiss in that area.” He said they may do training for future contracts. Some officials were particularly upset by the failure to notify employees of cloud computing companies that handle data for intelligence agencies. The cloud is a “huge target for foreign intelligence services in general — they love to get into that shared environment,” said Sowell, the former adviser to the Office of the Director of National Intelligence. “At some point, wouldn’t someone who’s responsible for the defense contractor base be aware of this and try to reach out?” he asked.